AEB CITY SYSTEMS ARE TESTED ACROSS A WIDE RANGE OF SPEEDS AND VEHICLE OVERLAPS. One common cause of whiplash injury is a low-speed, rear-end collision in which the driver of the striking car is distracted and does not notice that the car ahead has stopped. Such accidents can cause neck injuries to the occupants of both cars. 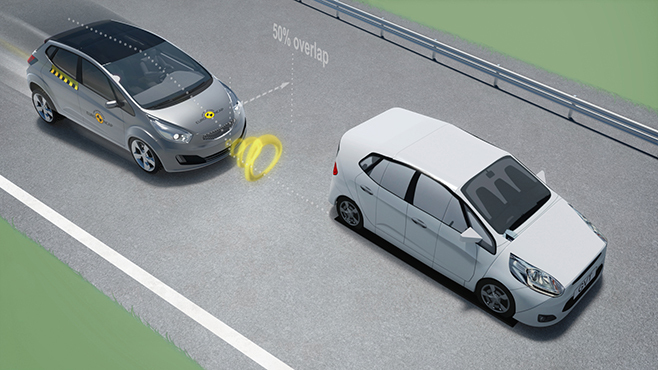 Autonomous emergency braking (AEB) systems detect when such an accident is likely to occur and can intervene by applying the brakes to try to avoid the collision. The test vehicle is driven towards the back of a ‘dummy’ target vehicle at speeds between 10 and 50 km/h in three scenarios; with the centrelines of the vehicle and target aligned; and with the centreline of the test vehicle offset to the left and to the right of the target. In the offset tests, the test vehicle’s sensors can ‘see’ the side of the target so from 2018 a more realistic target is used compared to Euro NCAP’s early tests. The Global Vehicle Target (GVT) is a re-usable 3D representation of a generic vehicle. The target is stationary for AEB City tests, although it is mounted on a remotely-controlled platform so can be moving in other test situations. During the tests, the driver deliberately makes no attempt to brake and the extent to which the car has reduced the impact speed is assessed. 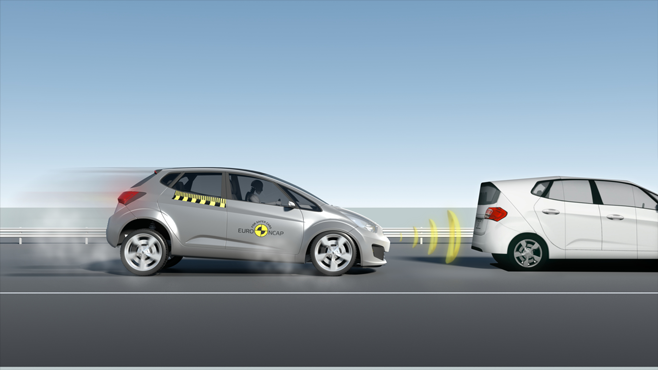 Some systems may warn the driver that a collision is likely before they intervene. However, in such accidents, time is so short that an effective response from the driver is unlikely to help and Euro NCAP assesses only the auto-braking function. Maximum points are awarded where the collision is avoided, to encourage the most effective solutions. However, some points are also given where the speed of collision has been reduced (i.e. the severity has been mitigated), as even small speed reductions can have a significant influence on injury outcome.